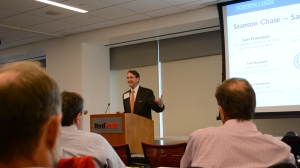 Don Reinke, a prominent partner at the leading U.S. Law firm Reed Smith, invited me to speak on recruiting board members at his recent Capital Markets Conference. He asked me to explain my statement that recruiting Board members is just the opposite process from recruiting executives! Here is what I shared with the Board members, CEOs, and CFO at this conference. I’ll start by giving you a bit of an introduction of what we do and who we are at Stanton Chase. We are a retained executive search firm, working with companies all over the world in 43 different countries, typically recruiting CEOs and their teams. We are included in the top 10 search firms in the world. Not one of the “Big Four” in executive search, we like to think of ourselves as a Mid-Market expert with a culture of “rolling up our sleeves” as our search partners stay involved in all the details and are hands-on managers of each search project. We have different industry practice groups and functional practice groups, one of them being our Board Search Practice. 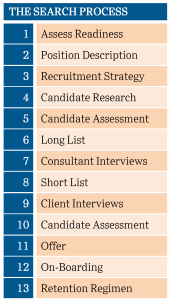 We start with a unique thirteen-step process to conduct retained executive searches…then, after listening to our clients, we customize this process for each search project. 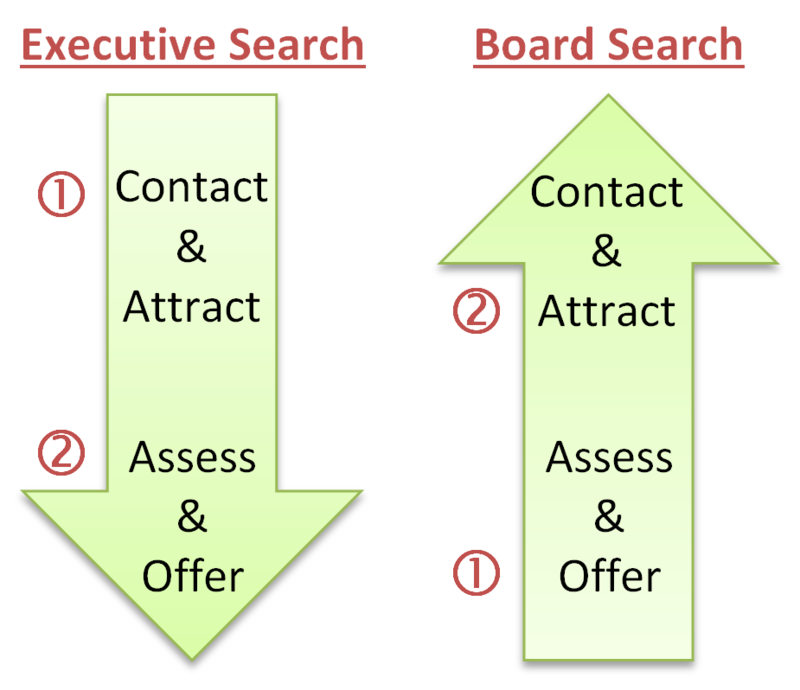 I was talking to a client about our search work and how our process differs for a board member search. I explained that we start with the same steps, however, around the middle (Step 5) we flip the process and turn it on its head. Normally we would go through a long list of candidates and talk to them, and develop a short list of candidates and really getting to know them, then present that to the client who then does more assessment. 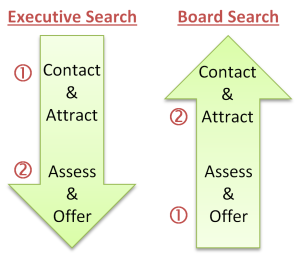 In Board search work, we turn it around. 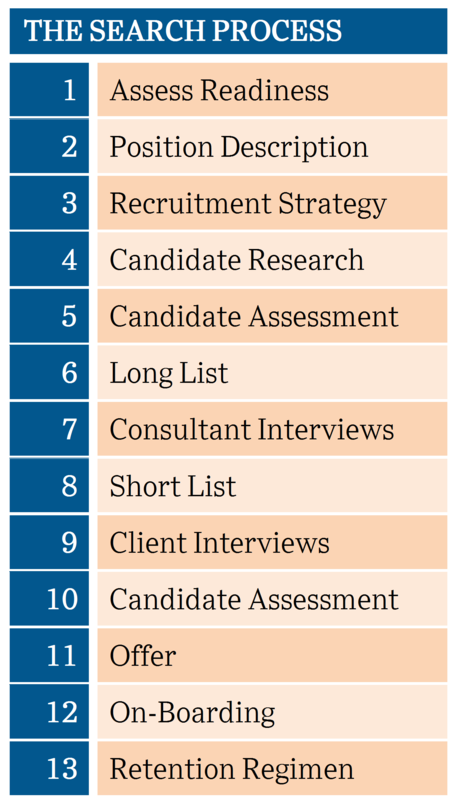 After laying the foundation of needs and readiness assessment, then we do the analysis of the long list of prospective candidates and narrow it down to a short list of candidates, assess them, rank them…BEFORE we speak with the prospects. Then we pick up the phone and talk to the prospects only when we have done that much work with the client. So it is very different. When we pick up the phone, the client is already debriefed about the person, ranked our slate and chosen the number one candidate we want to go after. Can’t get number one? Well, then we call number two! When we speak with the candidates, we say we nominated you to be on the board of this company. We know this much about your background, we have already brought you through this process, now we want to know a little bit more about your interests, strengths, availability, and requirements. There are constraints on prospective board members: how many boards you can join, the different type of boards, how much time you have, travel schedule for attending meetings, and others. To find out if they are a fit, we will go through the clients Board Meeting calendar with them and make sure they can attend the meetings. We talk about compensation and sub-committee work they could do. How to prepare the Board Matrix? What skill sets and activity level do they bring? What is the mission of the company and board today? What are the skills sets, influence, and connections needed of board members today to achieve our mission and goals? We put the Matrix and candidates together through the nomination process, then we run a normal offer and onboarding process. A lot of effort goes into working with the search committee of the board, ranking the candidates, then contacting them, swapping information for further analysis, and everything else that goes on before we get to the final selection and board member approval. I like recruiting board members because you talk to fascinating people who may be going through transitions in their lives. Maybe we are meeting an esteemed individual who recently retired and is asking “what do I do now?” Prospective candidates are faced with lots of options, and opportunities on a board are a part of those options. We participate with them in this dialogue. If you want to be on a board, what can you do? One of my thoughts is: be visible. If we are going to do that much background work before picking up the phone to speak with you, make sure that we can find you and your qualifications. Whether that is on LinkedIn, Google, company websites… be visible. The second thing is to work up your board ladder. What does that mean? That means being qualified to serve on a board by serving on boards. Start with non-profits, maybe a community board, a homeowner’s board, work your way up a trade industry board, then private company boards, then ultimately publicly-traded company boards. We look for a progression through that process. Also, know the committees you want to serve on. Executive, Compensation, Audit…each committee is unique. If you serve on an audit committee, be sure you are qualified as ACFE (Audit Committee Financial Expert). Third, let your network know that you want to serve on Boards, and specifically which industries, size, culture, and type of boards. You can also go to the AESC website (www.bluesteps.com). It is a database built by the leading trade association of executive search firms, so it is a great place to get visibility bang for your buck. Candidates self-populate their information and the only people that can access it are member retained search firms looking for executives and board members. In summary, if you want to serve on a board, be visible, work your way up the corporate ladder, and let people know. If you know someone in an executive search firm like Stanton Chase that is doing board search work, let them know! if you are looking to build out your organization’s board, then call in an expert. They can ensure the board conducts a thorough needs assessment, accesses a wide candidate slate, preserves the dignity and egos of prospective board members, and projects a quality process to the board member community, supporting future board member recruitments as well. Boards are meant to oversee compliance, guide, provide access and counsel, and recruit the top executives. Doesn’t every organization want the best board possible?